In good iconographic tradition, it’s understood that all of creation has a part in venerating God and this understanding is true in my experience for the icon’s palette. Every bit of soil, every form of animal, and every kind of plant sings, or dances, or groans (sometimes) in worship of the Creator. With the ochres from the earth and the black from animal bones offering their hues to the icon’s palette, every year with the fall’s woad harvest, the plant kingdom completes the studio colours with the addition of a beautiful blue. When I first began using local materials to create the pigments for my icons, I began with one colour—the ochre of the Conestoga River. Over a couple of years, I added the blacks and reds I needed from other local sources and simple processes. But when the opportunity came to create an icon entirely from a local colour palette, blue eluded me for some time. The geology of Southern Ontario doesn’t provide an environment for blue minerals and most plants yield dyes, which are too fleeting in their colour for use in iconography. While blue may surround us in our daily lives—being as vast as the sky and the ocean itself—try to take hold of it and all you’ll be left with is a handful of air or water. Bright green woad leaves ready for harvest. The answer came by way of a gift of seeds, and has continued to be a blessing every autumn since with our family’s new tradition of harvesting blue from woad plants. Mary Britain from the Cottage Gardner, an heirloom seedhouse in Ontario, and I connected about my desire to create a blue pigment in Conestoga. She generously sent me a large handful of woad seeds in the mail to encourage the effort. The woad plant is a cousin of the more famous indigo plant, which dyes everything from blue jeans to military uniforms. Both plants produce a colour called indigo, but from woad it tends to be more grey rather than green (which I personally love). But unlike indigo, which needs hot seasonal temperatures to flourish, woad thrives after our cold Canadian winters and has been grown across North America for centuries. The most surprising thing about the indigo colour created from either plant is that it is a pigment, not a dye—indigo doesn’t dissolve in water, as dyes do, and is therefore a pigment. This is an unique property in colours derived from plants, and also one of the reasons why indigo can be baked into special clays and create a pigment that is both lightfast and acid-proof—a process created by the Maya peoples and used extensively in their culture. While I won’t get into those processes in this article, it is an amazing pigment to make and perhaps something worthy of documentation in the future. As a matter of fact, our woad harvest really began this spring, when we sowed the seeds (which you can read in my previous article, Getting Ready to Grow Woad Blue) and tended and weeded them up to our harvest, but the creation of my yearly supply of blue happens each year around this time. The plants grew very well overall, but there were also some places where the seed didn’t take, or plants were killed (mainly by the chickens escaping their yard and scratching them), and so the amount of leaves we collected wasn’t as great as some years. But, with such healthy plants to harvest, it actually turned out that the resulting amount of pigment was greater—and its colour more beautiful—than previous years. Our woad vat with a cute helper. During our day of harvesting, we worked together in many experiences. We foraged woad, built roaring fires, washed piles of leaves, and watched as the air turned our mixture from green to blue. It was a long day, but one done cheerfully and with a spirit of discovery. There was a fulfilling enjoyment in the tasks—at one point during the long process of tearing the many leaves spontaneous songs even broke out! I once read an interview with a Japanese indigo farmer who commented, “Because my Indigo is created with such love and attention I know that it will be a beautiful colour.” It’s with the same sentiment that I know my woad blue, created with such careful efforts and joy, has a place in creating something beautiful in an icon. Recently, I’ve had a number of people ask me about making pigment colours for their own work. In order to try and help, I agreed to document and explain a bit more of what I do in creating the local colours for my studio in Conestoga. In that spirit, I’m taking this chance to share some details about this year’s harvest. I usually break down harvesting of the woad blue into seven steps. Preparing the woad plants is quite straight forward. The leaves are cut at the plant’s base, which is an easy process with a sharp knife, and then washed. After this is done, I pile the leaves on a blanket while preparing for the next step. In previous years the washing was quite intensive—sometimes requiring two washings before the water was clear. But it seems that growing the woad in planters raised them a little off the ground, and the result was much cleaner leaves. Once the leaves are washed, I tear them into pieces roughly 5cm (2 inches) long. This makes it easier for the leaves to break-down when they are being steeped later. The tearing of the leaves also offers a chance to further scrutinize the quality of the leaves and remove any leaves that are brown or rotten. During this process, the stems of the leaves can be discarded as they don’t contain any pigment. This year, once the leaves were torn, we filled a 40 litre (10 gallon) pail with them. 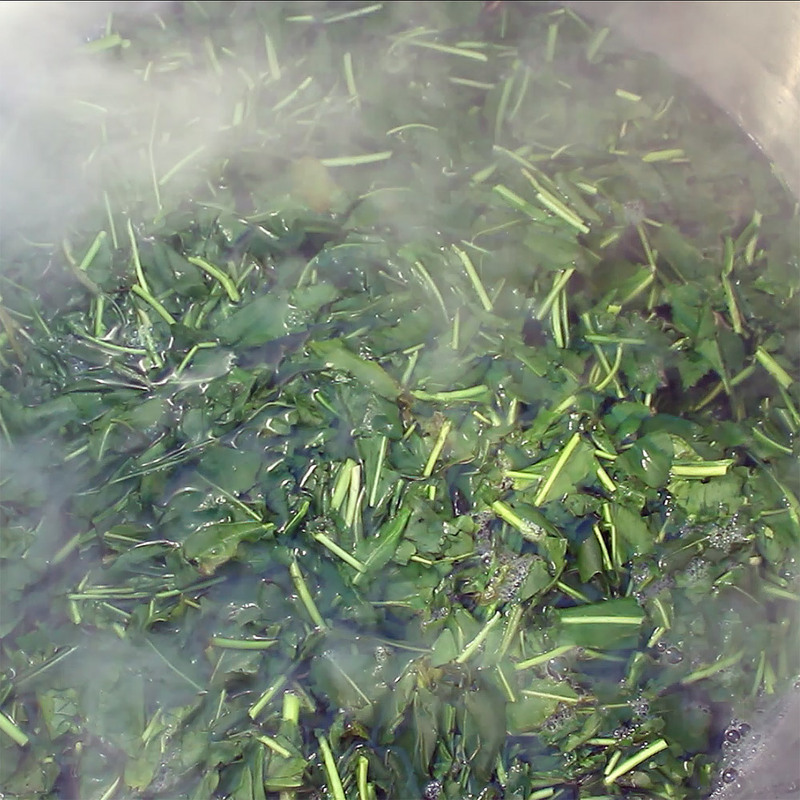 In order to release the Indigo pigment from the woad leaves, the leaves must be steeped in hot water. The quality of the water really matters in this process. In my experience, if the water is hard, the pigment will not as easily be released. The temperature of the water also matters. It needs to be heated to 80°C (175°F) and the leaves left to steep in the hot water for 10 minutes. This year I heated 75 litres (20 gallons) of water for the task. I had previously cleaned out one of our garden rain barrels and collected this water. However, I also had 20 litres (5 gallons) of distilled water which I used along with the rain water. Once the leaves have been steeped for 10 minutes, the water needs to be cooled as quickly as possible to 55°C (130°F) to preserve the quality of the blue. Depending on the amount of water, it can be very effective to put a small bucket into a sink full of ice cubes. However, when dealing with larger amounts, I usually hose the vat with cold water. It took about 10 minutes for my vat to cool this year. In previous years it took up to 20 minutes (which I wasn’t happy with …). However, it was a very windy day this time, and allowing the water to evaporate on the vat’s metal sides was very effective in cooling it down. With the leaves done steeping, they now need to be removed from the vat. While the water is still quite hot to my hands, if I take a little at a time, it’s manageable. The wet leaves are squeezed and as much liquid as possible is expelled. The leftover, “woad-balls” should be collected, and are excellent for creating rich compost for the garden. It’s worth being careful to collect all the leaves during this step as whatever bits are left in the vat will likely pollute the final pigment colour. I usually collect the leaves with a stick in the beginning and then finish it up with a colander mesh. My wife always laughs at me here, as her hands are much tougher in hot water than mine, and I think our children find it funny to watch me squirm while she comfortably squeezes batch after batch. Before the woad can be released, the pH of the water needs to be turned basic. This can be done in many different ways, but I’ve come to rely on soda ash (sodium carbonate). The soda ash should first be dissolved in hot tap water and then added to the vat. After each time, I measure the pH again so that I don’t add too much. After the pH has reached 9, the vat is ready for the next step. The greatest caution here is that the temperature of the water must be below 50°C (120°F) before changing the vat’s pH. If this is done beforehand, the colour of the pigment will suffer. I started this article by reflecting on the blue of the sky and the last missing ingredient for creating our blue pigment is the air itself! With everything prepared, we need to aerate the vat. This can be done in a number of ways. For the size of vat I’m working with, I use an old paint mixer on an electric drill. While its momentarily loud, it does a great job. For smaller vats, people seem to use whisks or even just sloshing it between bowls. But, my favourite example of how to aerate a vat was invented by a student when I was teaching up at the Emma Lake Kenderdine Campus of the University of Saskatchewan. This student rigged it so that the top of their vat was sealed by a latex glove—and thus by turning their vat on its side and stretching the glove repeatedly, air bubbles were introduced into the liquid. Regardless of how you choose to aerate the vat, the foam that appears will be brown-green when it first appears. Then, after 5 to 10 minutes, it will quite suddenly turn to a blue—a moment always greeted with a loud cheer in my studio! It’s a good idea to keep aerating the vat after this point until the blue foam retreats again to a green foam (but this sometimes isn’t possible). 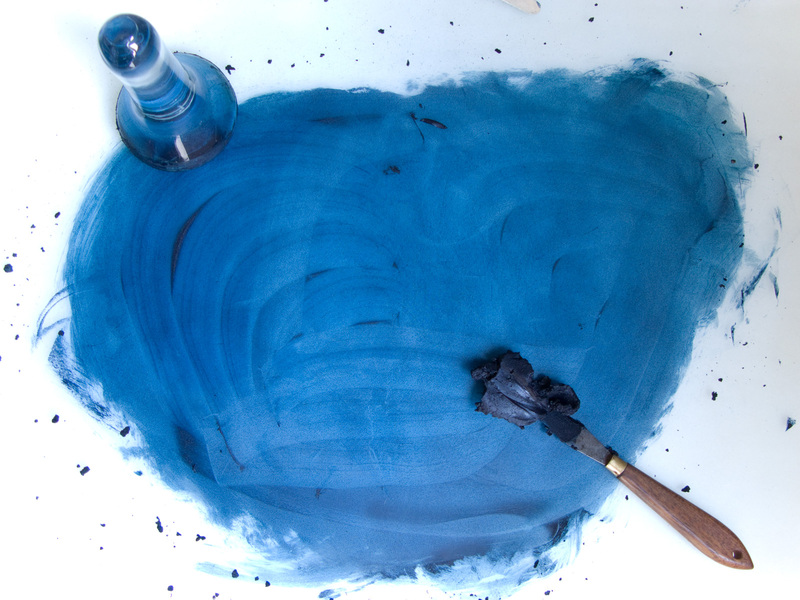 Indigo blue pigment, from woad plants, has now been created. This year the vat was aerated for roughly 10 minutes. Unlike the year before, the green foam turned blue very quickly and contained a lot of pigment—as was demonstrated in how much it stained my finger when I touched it. Once the woad blue pigment is free it can settle out overnight. The rest of the process involves cleaning the pigment by cycling it with clean water over a couple of days, and then allowing the pigment to dry. I do this by removing the clear water on top after the pigment has settled a bit, and then drying it in a cool, dark place. Grant, Colesworthey. 1860. Rural Life in Bengal: More Particularly in Connection wi the Planter and Peasantry, the Varied Produce of the Soil and Seasons; with Copious details of the Culture and Manufacture of Indigo. London: W. Thacker & Co..
West Fitzhugh, Elisabeth, editor. 1997. Artist’s Pigments: A Handbook of Their History and Characteristics. Oxford: Oxford University Press. Garcia, Michel. Filmed 2014. Organic Dyes to Pigments: Foundations for the Colors of Europe. Berkeley: Yoshiko Iwamoto Wada, video. All About Woad. Accessed 2017. How to Extract Woad Dye in 12 easy stages. http://www.woad.org.uk/html/woad_extraction.html#woad-extraction-requirements, website. I love watching your video, I am fascinated with processes and working with natural materials. I am a Colombian artist working in London. I am passionate about pigments and every year gather and process rock/earth pigments in Colombia. I also create new pigments using metal powders. 50% of my practice is dedicated to create a pigment collection of gather and processed pigments, created pigments and bought/donated pigments. I have an Instagram account: catalina.christensen. Thanks for commenting and introducing me to your work, Catalina. I also really enjoyed your In Pursuit of Colour video and seeing the local colours you found in that landscape. Is that somewhere in Colombia? I look forward to seeing what you post next on Instagram. Thank you Symeon again for sharing your process of crating the Woad, would love to be there one year to watch and help. So fantastic seeing your children grow and enjoy what their father is doing. Nothing like family working together. I will always cherish the time we hiked Tranquille. Wonder if one could gropw a little Woad on a balcony? I’m glad you enjoyed the video, Kelly. I don’t see why you couldn’t grow a woad plant in a large planter … Just make sure it’s full of rich soil, and will get lots of sun, and you should be able to harvest a little colour to play with! Wonderfull! I would love to try! Was this the blue pigment used in medieval times to enluminate the Book of Kells? Where can one buy the woad seeds? Is there a specific woad that contains more pigment? And is it a sun-loving plant or can it grow in mid-shade conditions? Thank for sharing your science. And, Woad plants love as much sun as they can get. Growing them in a bright sunny spot will increase their yield. I hope this helps and would love to hear how your own harvest turns out. Does the finished pigment contain toxins and does it react with other pigments? Indigo pigment can cause skin and serious eye irritation, according to its Safety Data Sheet, and it’s a natural antiseptic. Like any dry pigment, you should be careful not to breathe its dust. I’m not aware of any reactions with other colours, but it is a pigment that does not react well in direct sunlight, and will fade. However, its use in icons for undercoats is well documented, and depending on the application can be kept quite bright if kept out of direct sunlight or protected with a UV absorbent varnish.